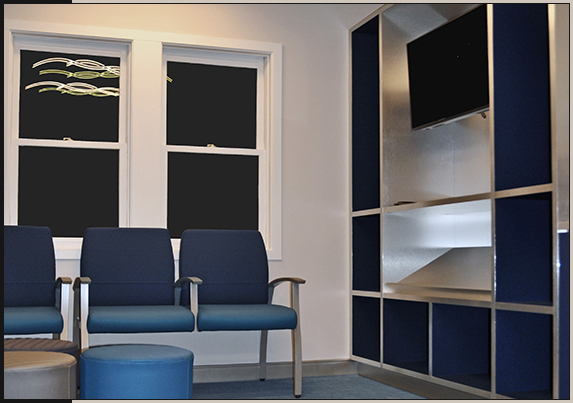 Dr. Campbell, DMD purchased a dated dental practice in Higganum CT. 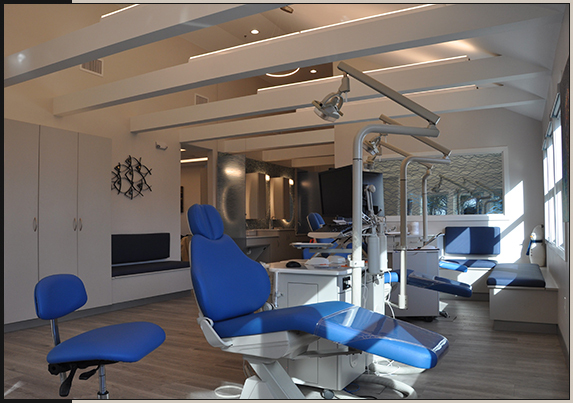 He hired FX Dental Design to create a functional check-in waiting area, that would invite his patients into a calming environment. 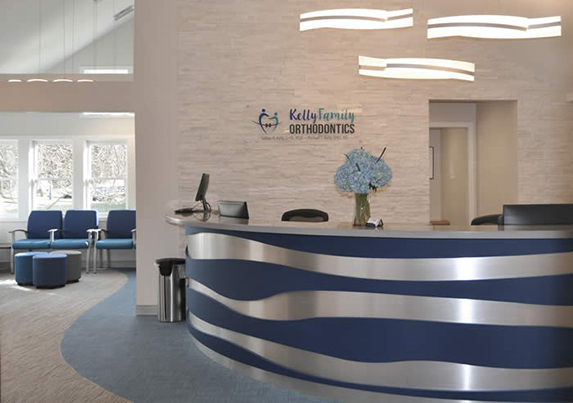 FX Design's Dental team created a large check-in counter that extends into the waiting area. Exiting the treatment rooms, patients are directed to the check-out pay counter, which extend into the corridor. FX selected a soothing blue/gray pallet, that included Luxury Vinyl Tile (LTV) plank flooring to eliminate soiling from entry to check-in counter & beverage bar. We selected Shaw Contract Luxury Vinyl Tile Uncommon Ground Series product; which is 20 Millimeter thick, with a 10 year commercial warranty. Based on FX Design's extensive knowledge of interior finish products, our team selected LVT for its maintenance proof properties. LVT flooring requires little maintenance, just mop & go. To soften the waiting room, we transitioned from LVT to a commercial grade textured loop carpet by J&J Commercial, to soften the room. We then continued the LVT plank flooring into the operatories. 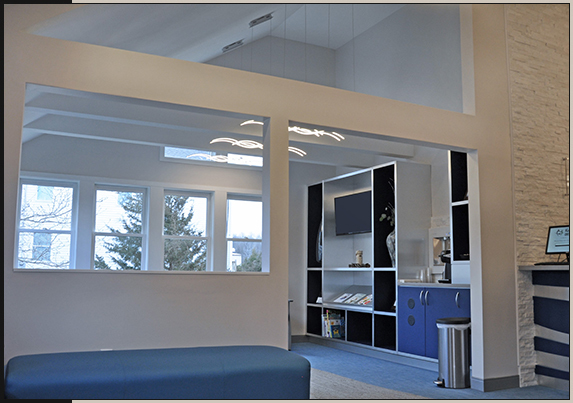 Dr. Campbell asked FX Dental Design to re-purpose his existing dental operatory & sterilization cabinets into the newly renovated offices. 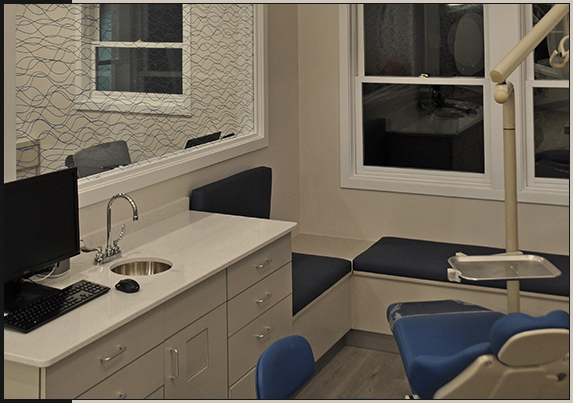 FX Dental Design encouraged Dr. Campbell to allow FX to select new solid surface counters to provide a clean aesthetic. FX Dental Design chose a solid surface counter top material from Silestone Quartz series, based on its non stain, aesthetic qualities. The aggregate quartz material is all natural & biodegradable, recycled content. Also Silestone offers a cost savings when compared to alternative solid surface products such as Corian, Cambria, or granite. Notice the beautiful glass mosaic tile from Crossville's Ebb & Flow series. We designed the mosaic to ebb into the check- in counter to add texture, then flow into the backsplash of the adjacent beverage bar creating soothing texture.